Carol King samples the tastes, sounds and smells of one of Sicily’s most popular festivals on the slopes of Mount Etna. Autumn in Sicily brings with it a variety of seasonal produce. The fertile volcanic soils on the lower slopes of Mount Etna are ideal for agriculture, supporting a wealth of vineyards and orchards. Each year towns and villages clustered around the smoking volcano hold festivals to celebrate autumn’s arrival and try out the fruits of the new season. The most famous festival is the Ottobrata held each Sunday throughout October in Zafferana Etnea. Situated on the east side of Etna, 12 miles north of Catania, the town offers excellent views out across the Ionian Sea. During the Ottobrata, the 9,500 Zafferanese spill out on to the streets to join with coach loads of Sicilians to have some fun, eat, drink and then eat some more. Now in its 34th year, the Ottobrata provides the opportunity to stock up on local specialties like pomegranates, prickly-pear fruit, wine, grapes, olives, pears, chestnuts, porcini mushrooms and cheese. The town centre is transformed into a large market thronging with people making their way through the streets and squares, all laden with their purchases – and keeping an eye out for the next one. Occasionally the crowd parts to let pass a procession of locals in colourful traditional dress singing songs in thick Sicilian dialect, strumming guitars and banging tambourines. However, the Ottobrata is not all about shopping. 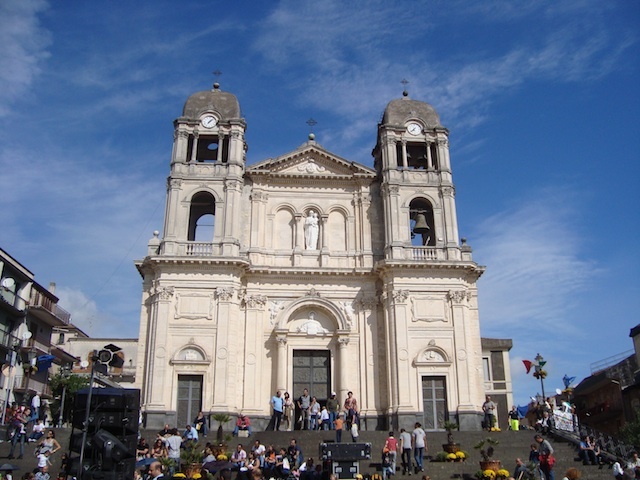 Children gather on the steps of the main church of Santa Maria della Provvidenza (St. Mary of Providence) ready to watch a puppet show. A large queue forms at a stall dedicated to selling risotto alle mele dell’Etna (Etna apple risotto). Etna is notable for its apples that come in 15 varieties, including the Cola, Gelato and Gelato Cola. Some are medium size with yellow skin, others tiny and green. If you want a real apple feast, finish off lunch with an apple dipped in chocolate sauce. This is a treat as when you bite into the firm skin covered in a slithery warm chocolate sauce you can still feel virtuously healthy as you crunch on a chunk of the sweet, juicy flesh. You may prefer to sample a foglie da tè, a light biscuit made with pistachio and almonds that is found only in Zafferana Etnea. To round off the gastronomic experience there are plenty of liqueurs to try in a bewildering array of flavours – some of them strange: lemon, prickly-pear fruit, cinnamon, fennel, coffee, basil and bay leaf. The town itself is known for its honey and Zafferana Etnea is nicknamed ‘Città del Miele’ (Honey Town). Beekeeping took off in the 19th century and went on to prosper to the point that 15% of Italian honey is produced in Zafferana Etnea. The rows of honey jars lined up on stalls at the festival appear to glow in the sunshine. There is a staggering selection of kinds of honey on offer, too: orange, lemon, mandarin, orange blossom, eucalyptus, strawberry, chestnut, pistachio, and thyme – the variety seems endless. Each honey has its own bouquet and distinctive taste: mandarin honey has a delicate citrus smell, creamy texture and delicate taste with a zesty bite. Honey isn’t the only product the town’s beekeepers sell: there are beeswax candles, royal jelly, and cakes and pastries made with honey, such as the wildly tempting zeppole rice balls covered in honey. A hearty lunch prepares you to inspect more wares. The Ottobrata has one of the best craft fairs in Sicily, with delicate handmade jewellery, multi-coloured scarves and zany puppets tempting you to their stall. Antichi mestieri artesans line the streets to show off their skills at basket weaving, marquetry, carving from volcanic rock, and forging wrought iron into ornate shapes with hammer and tongs. If you have the energy to carry on there are concerts each evening during the Ottobrata. But for me, to enjoy the atmosphere on a sunny day and venture home with bags full of goodies to try was enough to appreciate the Sicilian autumn.